Last but not least, my dearest Great-Grand-Little, Jill, and her cutie patootie boyfriend, Alan, at Quirk Hotel! Beautiful Jill went to VCU with me and we are in the same “family” in my sorority, Alpha Omicron Pi. After graduating from VCU, Jill was quickly accepted to Georgia Tech’s Public Policy Masters program! I remember it just like yesterday that I was meeting Jill for coffee in a small shop in Richmond when she was thinking about moving there and applying. Now look at her! I have never seen her more happy and I know that a huge reason behind that smile is because of Alan. 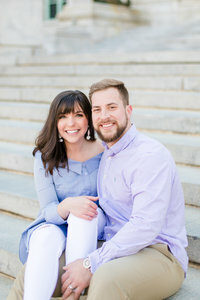 Alan was visiting from out of town to meet Jill’s family this weekend so how amazing is it that they got to document such a precious time with a mini session at Quirk Hotel! We were a little bummed because the hotel was EXTRA busy Sunday morning with people so we weren’t able to utilize it the way we had wanted, but I still think we got some amazing shots of these two canoodling around the adorable building! It just goes to show that if you have a small location, 10 minutes, and awesome light – you can get amazing portraits! To see other posts from our Richmond weekend, click on the links below! « We’re Officially Selling Our First Home! !